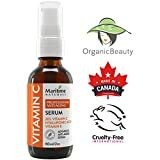 FREE BONUS - This Anti Wrinkle Face Cream works wonders on your face, but when you combine it with a complete Anti Wrinkle regimen, you can almost literally replicate the effects of the Fountain of Youth. Anti Wrinkle Creams are just one part of the equation - That's why we're throwing in a FREE EBOOK full of the best tips and tricks to keep yourself looking younger, more vibrant. This is a deal you WON'T get from any other big name brands! 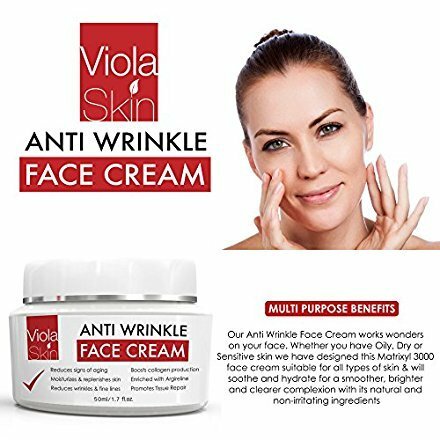 ANTI AGEING BENEFITS - ViolaSkin's Anti Ageing Face Cream provides maximum hydration to help reduce deep wrinkles, dark spots, and uneven skin. With ingredients like Vitamin C (ascorbic acid), Matrixyl 3000 (palmitoyl-tetrapeptide) & Hyaluronic Acid (Sodium Hyaluronate), which work together to reverse these signs of ageing and improve your complexion, boost your collagen production to give you that youthful glow you've always desired. DESIGNED FOR YOU - Whether you have Oily, Dry or Sensitive skin we have designed this (palmitoyl-tetrapeptide) Matrixyl 3000 face cream suitable for all types of skin & will soothe and hydrate for a smoother, brighter and clearer complexion with its non-irritating ingredients, With this uniquely designed anti wrinkle cream for women and men. OUR PROMISE TO YOU - Your skin is beautiful, and we want to help you let that beauty shine through. That's why you're backed by our 100% Satisfaction and Money Back Guarantee! If for any reason at all, you're not completely happy with your purchase, don't hesitate to drop us a line - we'll make sure you get a FULL, NO-HASSLE REFUND, no questions asked refund on the Anti Wrinkle Cream!